Tegami Bachi: Letter Bee is really a great anime. Starting with the setting, this anime brings you into it's world without killing you with loads of details that you absolutely need to know to understand half of anything that starts to happen. The story line is great too, not really complex, but it isn't childishly simple or random either. Animation for Tegami Bachi is probably one its strong points although for some it may take some getting used to because of some 3D parts. I personally don't like the obviously 3D parts in an anime, but this show pulls it off so well that it fits right in and doesn't glare at you the whole time you watch like in some others. As for the regular animation, its awesome. The openings and endings in this first season have been awesome so far too. You'll actually want to watch them a few times, because they are so well made (both animation and music). The music and sound fx are nice too; Not amazing to the point where you'll watch this only to hear the music come on, but it fits all of the circumstances in the anime without ever sounding out of place. All in all Tegami Bachi is a good watch that'll have you coming back for more, and not just because you have a bad habit of trying to finish whatever you start. I want to congratulate the mangaka for this anime (originally manga). It has a completely original storyline, not one of those cliche school life dramas, or weak mecha/sci-fi adventures (not that there's anything wrong with those). The animation is fantastic; it almost brings you into their world. The music is mind blowing, with the opening song by Sugo Shikao called "Hajimari no Hi" who also did the opening songs for xXxHoLic. The ending song by Himeka "Hatenaki Michi" truly grabs your heart and throws it into the sky. That free falling feeling comes after you listen to the song. Very very beautiful. The characters are not your typical Mary Sues. The main character is a cry baby! But that's what makes this anime work so well. Expect the unexpected, and be warned that there IS lots of crying in here. But it's worth it. So very very worth it. Long story short: I truly believe with all my heart that this anime will be very interesting and worth watching. Beautiful story and amazing art. This have to be one of my top favorite animes. I love the art style, and the characters. Lag is an emotional main character, but after seeing the first episode, all I want to do is cheer this little boy on! I thought it was smart making Gauche show up in the first episode, as it got me attached to his character before Lag goes searching for him. I first only watched it because my favorite singer is the artist for the first ending theme, but in the end I'm SO glad I gave Letter Bee a shot. Not the greatest, but I love it anyway. Tegami Bachi is my favorite manga, so I was very happy to find the anime. There are lots of thing to like about it. The story is really quite interesting, taking place in a country called Ambergound, which is stuck in perpetual night. A manmade sun hangs over the capital, in the middle of the country, giving it light and warmth. In Yodaka, the region farthest from the sun, Lag Seeing lives peacefully with his mother, until she is mysteriously taken to the Light by government agents, and he is 'mailed' to his aunt. Gauche Suede is the Letter Bee (Letter Bees are like the postal workers in Amberground) responsible for delivering Lag. He at first refuses to befriend Lag, his reason being that he is not allowed to know the contents of a letter, but by the end of the trip, Lag and he are friends. Their trip together inspires Lag to become a Letter Bee too, and five years later, he is allowed to cross into the middle region, Yuusari, to take the Letter Bee test. He passes the test of course, but afterwards, he finds out that Gauche lost his Heart(heart is like soul in Amberground) and disappeared after being promoted to Akatsuki, the capital. In the manga the story progressed quite well. The anime goes its on way halfway though, which would be fine, except it ended before tying up some plot holes, which will annoy you if you aren't willing to read the manga. This doesn't take away much though. The anime remains heartwarming adventure to the end, with some interesting surprises, and a few morals too. As for the characters, well, they're fine. I will say, the protagonist, Lag, can be quite annoying, because he is the quintessential crybaby. You will be in the middle of a nice touching scene, and then, suddenly; "BWAAAAAAAAAAH". Otherwise, he'd be fine, if not a bit of a wimp. His 'dingo', Niche, is honestly still more interesting, though annoying in her own ways. On the plus side for characters, I'd say Tegami Bachi has some of the better female characters in shonen, seeing as they are more than ditsy, voluptuous female leads. As for the animation, it's not spectacular, but it won't burn your eyes out. The only reason you'd really complain is if you go in with a critic's eye, looking for every bad thing about it. I wasn't so impressed with the color scheme, but the art itself(from the manga) was rather nice from the get go. Overall, Tegami Bachi isn't glorious, but it's still an enjoyable show that will at least haunt the back of your mind. Tegami bachi is a sad and adventures story, this is the first time i have cried watching something. Its sad it only has 50 episodes but it is one of my favourite animes that any anime lover could watch. Please if you ever have the time please watch tagami bachi. I wish it was more than just 50 episodes, this had a combination of everything that would make the series a classic. There were no episodes not worth watching or skimming even. Every episode was done with no filler and brought you into this world. Because the ending was open ended I'm assuming there would be something more to this later on, a lot of holes were left in the plot and basic structure of the story with questions unanswered. Worth the watch regardless. Excellent anime which will leave you wanting for more! 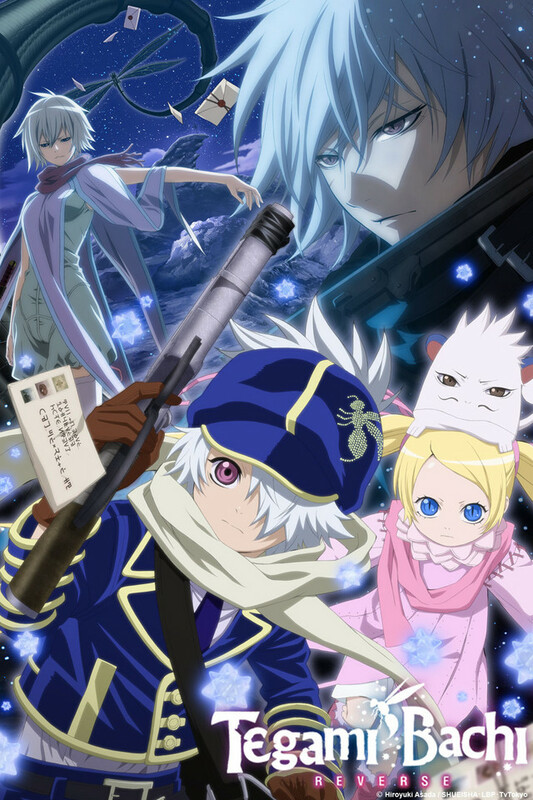 Tegami Bachi is one of the rare anime which really impressed me! The music was good and the characters were loveable and intriguing! It really makes you wait for the next episode and the storyline really grabs ur interest! While watching this u will not have the feeling of being lost ............ It really has a good, excellent plot!!! I love this anime. Everything, from the plot, to character development, to the animation itself is done perfectly. But what makes me rewatch the series over and over is really the story, beautifully told.